Joining Janet Kennedy on the podcast are COO Dede Houston and CEO Monica Wood, Co-Founders of Myxx. Announcer: 00:02 You’re listening to Trade Show Live! On the Road featuring conversations with the people who bring trade shows to life, including attendees, exhibitors, sponsors, and trade show, industry thought leaders. We attend trade shows around the country in a wide variety of industries, from healthcare to consumer products and everything in between. The podcast is a production of The Trade Show Manager, a trade show consulting firm, and now let’s go on the road with Trade Show Live! Janet: 00:30 Welcome to Trade Show Live! On the Road. This podcast is a production of The Trade Show Manager and features an in depth look at the people, companies, and organizations that bring trade shows to life. In January 2019, we are headed to CES, the Consumer Electronics Show with an amazing group of startups and business leaders will be in Eureka Park and displaying some of the best new ideas coming from the startup community in North Carolina. With me today is the team that has co-founded Myxx. 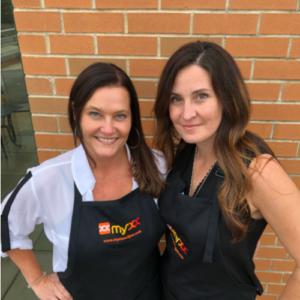 Myxx is spelled m y, x, x, and it is a platform designed to help you shop so much more intelligently so that you are getting healthy foods into your basket, designed to match up with recipes so you actually know what you’re cooking when you get home. I think that is a brilliant idea. I’d like to welcome Dede Houston, who is the Co-Founder and COO and Monica Wood is the Co-Founder and CEO to the podcast. Welcome ladies. Monica: 01:31 Yes, thanks Janet. We’re excited to be here today. Janet: 01:34 I love your platform and for folks who aren’t aware of what Myxx is, this is a new and exciting thing. We have another podcast episode where we get deep into the details of what makes is all about and how it works. However, I would really like you guys to give us the high level. How do you describe Myxx in your elevator pitch? Monica: 01:55 What Myxx is, we like to say, when you come to our site, it seems like a recipe sites, but we’re nacho average recipe site. I will definitely not a comedian as a trained data scientists, but what we really do is we help you understand what items match to the recipes at your local store. You don’t need to wait a week and have something delivered in a box for a recipe. You can do that using recipes you cook with today and product you love at your local grocery store. Janet: 02:29 Oh, that sounds so easy. There’s gotta be a challenge here. Like for instance, I’m a terrible cook. Dede: 02:38 If I can do it, anybody can do it. Janet: 02:41 All right. Is that what? What made you start Myxx? Monica: 02:46 So if I go back to bed and I worked together at another startup and we always wanted to work together again and we really got along well and that was an exciting startup that we grew really, really bad and we worked with CPG brand manufacturer, so the product sold in grocery stores and marketing efforts, so digital ads. That was kind of our background. It always. We always thought about what we would do together and I had moved on to another startup out of Washington DC and I was flying there four days a week and I have three kids at home and I would call home and I would say, hey guys, would you have for dinner? And they would say, oh mom, it’s so great. It’s like Bojangles or burgers or pizza, and every time I called him I just felt like I failed. Janet: 03:31 I mentally have a picture of you just cringing because you want to be supportive of your partner, but on the other hand you’re like, why are you feeding them that? Monica: 03:39 Absolutely, and I was calling home and really just feeling like I was failing them and that’s really because eating healthy was something core to me in court to my belief because 14 years ago I lost 100 pounds and I did that through learning how to cook and cook by recipe and understanding what I needed to put into my body in order to be healthy. Before that I ate a lot of fast food and I didn’t really understand the ramifications of that. On my health and I didn’t want my children to ever have to face that because losing 100 pounds is not easy. It’s hard and that’s when I started with my crazy travel schedule that I am unable to feed my kids healthy food anymore. And Grocery shopping just seems like such a chore. Janet: 04:27 I do have friends that will on Sunday meal prep for the whole week. And while that sounds really cool, that actually sounds like three or four hours gone on a Sunday that I wish I were doing something else. Dede: 05:43 Monica, when she first approached me and it was about, you know, she wanted her kids to really understand the health and, and really eat more nutritiously and I just needed to feed my kids. I was like, I got tired of home and then being like, mom, what’s for dinner? I’m like, I have no clue. What did you fix? You know, it was, it was kind of a pain point of like, you, you’ve got to feed your kids. And it’s. I just wasn’t comfortable. It wasn’t that comfortable in the kitchen and I’m not a trained chef and all I could do to feed them anything, so this has been really a fantastic solution of being able to find recipes that actually fit my cooking style, but always now having an answer when my kids are like, Hey, what’s for dinner? I know what’s for dinner because it’s not about spending, you know, hours of meal prepping on Sunday, at least not for me, but it’s about just being planned out of like I know on Tuesdays that we’re going to have tacos or whatever it is and I have all of the stuff ready to roll and I’m good. I know I have 30 minutes on Tuesday. I know I have an hour on Thursday so that I can even plan which type of meals accordingly based on our schedule. So it’s been a real life saver for us. Janet: 07:00 One of the cool things about your platform is that not only will it give you all the ingredients that you need for however long you’re planning your meals, it won’t duplicate things, which I think is really cool, but it will also tell you where it is in the aisle and now I’m envisioning that the all the partners out there that are like, I don’t know, I can’t shop. You do it so much better than me. Oh, no excuses dude. Yeah, it’s Isle B. Go get it. Janet: 07:45 I think you should call this the no excuses. Monica: 07:51 I love that. That’s awesome. Janet: 07:53 So it’s great that you met in a startup and decided that you wanted to work together, but what you think’s going to happen, it doesn’t always work out. So what have you found is each other’s strengths and weaknesses in working together as a team? Dede: 08:08 That’s a great question and I think every day we’re blown away. We worked so closely, we spend so much time together and we still love and care about each other, both personally and professionally, so we have a really amazing relationship. So we’re very happy about that. But I think really what it was is that when we both knew that we wanted to do this and we had backgrounds in being startups, so we understood first off of what we wanted from a consumer perspective. Second of all, we understood what it meant to be in a startup. We knew that it was roll your sleeves up. It is getting down dirty and in the trenches and really making this work and I think we both have that passion, that curiosity drive and determination that it worked out really well for us. I mean, we’re definitely understanding where our gangs and gangs are, where we fit together, but we fit together so perfectly and understand when each of us have, you know, that section that we’re taking off with Monica is very much entrenched in our fundraising and our business development and, and really getting out there and being the face of our, of our company, but also coming from a data perspective on the product perspective, which is great because that’s not my background. Monica: 09:44 I agree. And every day I am so thankful that I had such a talented co-founder. I’m just extremely driven and motivated and positive and fun to be around hard. But it’s also exciting and fun when you have a lot of other people to have joined us that we’ve worked with in the past. So we’ve been very fortunate in lots of different areas. But what I countered, we don’t always agree in fact a lot of problems from different angles. And I feel like that has really given us a lot of strength because we can come up with the right solution instead of the fastest or the most superficial solution. We can come up with the solution moving forward and we respect one another and we don’t really try to take any of what’s happening personally, but we do support each other and not just each other, but I feel like our entire team feels that as well. We have a very small team. We’re very proud of what we’ve been able to accomplish with just a few people and it really showcases the technical ability of the team. So we are just going over 10 people to over the next year we’re going to double or triple that number. We’ve already started that hiring process for what we’ve been able to accomplish in a few years with just a few people. It’s pretty amazing. I’m in awe of all of the people that work with us. Janet: 11:25 I assume you’re not doing the programming side yourselves? Monica: 11:29 We are not. We actually have programs that we’ve worked with in the past that past that have joined us, which is great because we’ve worked together. You kind of know each other’s ins and outs and you can move forward and make progress a lot better and you understand and trust one another. Trust is so big, especially in a small startup, being able to trust that someone’s going to not only get work done, but understand the quality of work and where people’s strengths and weaknesses are so you can come in and kind of help fill in the gaps where needed. Janet: 12:01 Now you came to us through a partnership with NC IDEA, which is also a partner of North Carolina Startup Pavilion and in Las Vegas at CES. And I understand you’ve actually done some mentoring with them. What’s your background and experience with NC IDEA? Monica: 12:19 Oh Wow. We’re so blessed and fortunate to be apart of the North Carolina startup community and it’s really across the board. NC IDEA idea has been such a phenomenal organization and invited us to be a part of a program last year for building strong leaders in North Carolina. And I had the great fortune of being able to be a part of that program and collaborate with other leaders that are growing out of this area and the triangle and that was just such a wonderful experience where we got to understand new leadership and work collaboratively with one another. So that was our first experience with NC IDEA and since then we have done other programs through them and through others, mentoring upcoming startup people with ideas, how to formulate their business plans and write their pitches all the way down to being a part of a coaching and mentoring at classes out of UNC Chapel Hill and Duke. And it’s just such a wonderfully collaborative community here that’s really looking to support startups and growth in technology. Wasn’t a genuine really appreciation for one another and I haven’t seen that anywhere else and our travels and in my career to be a part of such a great team and community. Again, I hate to keep saying community, but it’s the only word for it is it is a true community because we are supporting one another and we are all out for the greater good. Of what right and how can we do this together versus compete. Janet: 13:51 Dede, what’s your experience been like with NC IDEA? Dede: 13:54 So we loved being engaged with them and doing stuff with them. They’ve been, as Monica mentioned, they’ve been such a great community, such a great support to us. It’s nice being able to have people that you can reach out to get feedback, be able to share your ideas, be inspired by them and also hopefully inspire them as well. So it’s just been a great group of people and it’s something that, you know, I’m thankful that we have that ability to connect with these people that are kind of in here and all kind of rooting for each other to succeed and, and helping each other to succeed. So it’s been all positive and we’re very fortunate and excited about that. Janet: 14:36 I had a great conversation with Thom Ruhe who is the executive director of NC IDEA and it is amazing how often he also brought up the word community that, that he is very, very engaged and very, very about this interpersonal relationships. And, and he mentioned something about alumni events where even if you’ve been in a program wants, it’s not like it’s over, that there is this community of alumni that have been through one of the NC IDEA of programs where they continue to pay it forward and give back. Monica: 15:15 That’s a great point. It is not just one program and we actually even have a Slack group where we can get on and exchange ideas and who’s hiring for what, ask for contractor recommendations. It’s really truly amazing what they have created. Janet: 15:34 Now you’re going to be attending CES and taking out to the public. Now you don’t have a display there, but you are going to get to experience what it’s like to be at CES through the NC startup pavilion. We’re going to be in Eureka Park in the Sands. Eureka Park is 800 booths, all of brand new startups. And it is a high energy, fascinating place. And it, it really feels like the UN because the majority of the companies in Eureka Park are actually not from the United States. So just by being there, you’re going to get a very interesting experience with a lot of different countries as a matter of fact, we’re doing air quotes across the street from Singapore, so this is going to be a great event. But what do you hope to get out of CES for Myxx? Dede: 16:22 I’m excited to one, just share that word of mouth and let everybody know what we’re doing, what we’ve been up to you and, and just that were, that were around, but I’m so excited also to kind of look and see what else is going on and how can we again, I’m going to go back to that being inspired by, you know, all these other great ideas and these other great companies and great people. I’m just excited about seeing the future of technology and what’s going on that consumer world and, and being able to be a part of that. I think that would, that’s what makes me so excited. I’m such a curious person. So I like to see you know, what’s going on and hopefully that helps spur and inspire some of our future opportunities are our features. And our roadmap for Myxx. Monica: 17:13 Absolutely. And you know, taking that one step further again, just want to talk about how excited we are to release this to consumers this year. 2019 is going to be a big consumer focus for us. It hasn’t really been a focus over the past couple of years while we are building our platform and our technology. So we’re looking forward to really shouting it from the mountain tops or the showroom floor, I guess it’s no longer a great idea. It’s a possibility where you can actually shop and meal plan all in one spot for free for consumers. And it’s. But what we also want to do is we want to be able to meet with our partners so we’re meeting with a bunch of partners that were there that were going to be announcing these relationships over the next year as well as really engaging with what is new in our space, what is upcoming and how can we bridge new partnerships and new ideas to create in 2019 and 2020 and the future. So I really am excited for my first visit to CES and hopefully many more to come. Do you have any advice for us for us at CES that you think we should do since it’s our first? Janet: 18:28 Absolutely. Well first off know that it takes a lot longer to get from point a to point B, so plan a lot of travel time and then we tell the folks at our booth, so you probably would be wise to make sure you stash a few snacks and a water bottle in your bag because just whether it’s food or suDedeenly you’re starving and you seem to be about three miles from food. It’s really helpful to have some of those things to rely on. Monica: 18:56 Great advice! Have food and water water in my bag. Check. Janet: 19:03 And the other upside to our booth is we’re actually right near the food court and we’re also near the elevators and the bathrooms. So we scored a great place in this booth, in this area. I would be remiss if I didn’t actually allow you to tell people how they sign up for Myxx. Is it a free program and can they sign up right now? Monica: 19:30 Go ahead, Dede. Dede: 19:31 Yeah, you can go to Myxxed recipes.com. That’s m y, x, x recipes.com. It is completely free. You just go on there, put in your eye, your email to create an account and you’re off to the races. You’re good. You can go in and select your retailers. You can connect your cart, so you’re already set up as far as eCommerce retailers that you want to send your list over. Start searching. We welcome any feedback. We welcome if you have certain recipes you want to send us, but very free, easy, check it out today. Janet: 20:11 I appreciate the fact that it’s free and that’s the way it is for consumers. You know, we don’t want to pay for anything until we’ve tried it out and made sure it’s important to us. But what is your monetization strategy? Monica: 20:21 So we work with the brands that are on the site. So any of the food brands that sell into grocery stores, we work with them to help them activate their marketing spend. So we create landing pages that ensure that they have the product. So a lot of brands say, run digital advertisement for recipes and when you click on those recipes you can come to a landing page and that recipe is activated at a local grocery store for a consumer, so immediately that recipe as context and passed to the point of purchase with that product listed as the default item and then everything else that they need to make that as well. And then we capture the data and the analytics behind the decisions on that page and people purchase it. Did they purchase all of the items? Did they adjust the serving size? Did they change the retailer? Did they change out for dietary restriction? So there’s a lot of rich analytics that happens behind the scenes, but no worries in the privacy area, we definitely protect consumer privacy and we do not share individual information with with brands. We do try to gather the trends so that we can better serve the brand and the consumers of the future. Janet: 21:36 I am already signed up so I will test it. So by the time we get to CES and about two weeks, I will have some very good questions for you. So get ready. Monica: 21:46 We are ready for your questions and we are excited for all of the people listening to sign up again with Myxxrecipes.com. And that’s Myxx. Janet: 21:58 All right everybody, we will see you at CES or if you’re not going to CES, you can follow all the action in social media. Just pull up the Hashtag #CES19NC and all the folks who are going to be in the North Carolina Startup Pavilion will be using that Hashtag so you can kind of catch just our action along with the regular Hashtag. Janet: 22:24 You’ve been listening to Trade Show Live! On the Road. This podcast is production of The Trade Show Manager and features an in depth look at the people, companies, and organizations that ring trade shows to life. In January 19. We’re headed to CES and we have a lot more episodes for you to listen to. Featuring somebody great ideas coming from the startup community in North Carolina. Thanks for listening. Founder and CEO of Brilliant Sole, Jeff Guard is attending CES 19 as part of the North Carolina Startup Pavilion. Brilliant Sole is the ultimate smart footwear platform for VR and creators and was developed to solve the locomotion problem in virtual reality.